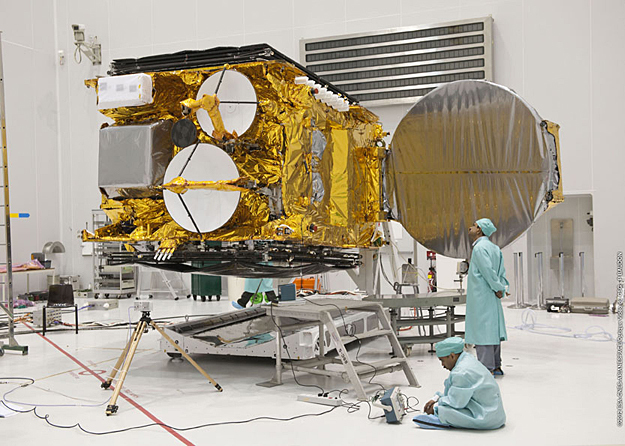 Test deployments of the antenna reflectors on India's GSAT-10 telecommunications satellite have been performed as part of pre-flight preparations for this payload, which is one of two spacecraft on Arianespace's next Ariane 5 mission from the Spaceport in French Guiana. GSAT-10's two reflectors, located on the "east" and "west" side of its rectangular-shaped body, were opened in the S5C high bay area of the Spaceport's S5 payload preparation center - where the satellite's solar panels previously were extended during the ongoing checkout process. Developed by the Indian Space Research Organisation (ISRO), GSAT-10 will provide Ku- and C-band relay capacity when it joins the Indian National Satellite (INSAT) system of geostationary spacecraft. The platform is based on ISRO's I-3K satellite bus with a power capability of some six kilowatts, and carries 30 transponders and the GAGAN (GPS and GEO augmented navigation) system. After its fueling, GSAT-10 will have a liftoff mass of approximately 3,400 kg. For its upcoming launch on September 21, GSAT-10 will be lofted along with the ASTRA 2F satellite as its co-passenger on Arianespace's fifth heavy-lift Ariane 5 mission so far in 2012. It will be the 209th flight of an Ariane family vehicle since the introduction of this European-built launcher series in 1979.